The weather was gorgeous outside, the stars were out, the temperature was in the 70's and I said to Mari, like I have over a dozen times before with typically zero positive response, "We should sleep outside tonight!" And wouldn't you know, she agreed! Off we were to an impromptu camping trip. 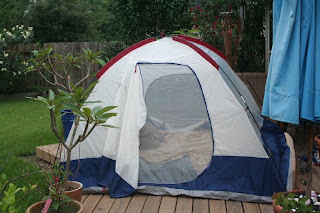 Well, actually, we just set up our tent in the backyard and plugged in the baby monitor. And since we're not true "campers" we tried to squeeze our queen mattress inside of the tent but it wouldn't fit so we just put the tent on top of the mattress. We enjoyed a beautiful Texas night lit by a full moon sleeping under the stars. We created a lasting memory for ourselves and hope to do this with the kiddos one day. So remember to have fun this weekend - even if you're staying at home. Enjoy the opportunities you have around you and stay young at heart! Everyone have a safe and fun Memorial Day!! "..He stretches out the heavens like a tent." Psalm 104:2 What a great idea! The kiddos look like they are finding plenty of fun also. Enjoy the weekend. Much love to all. So cute!! Love the attempt at camping. I would have done the same thing. 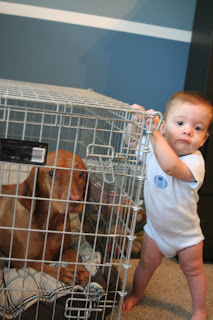 You have a vizsla!!! 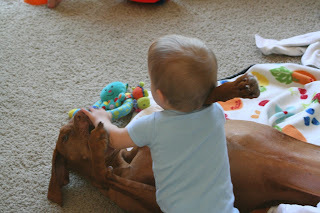 It's a vizsla! I have a vizsla! I love vizslas! Can't wait to see more baby-dog photos!!! You two are such an incredible couple and parents.....what a fun idea - camping. The kiddos are growing up in such a loving, fun and carefree home......I love that Noah looks offended that a picture was taken with them in the bath!!! The babies are just growing so fast and they are all precious! Love that tent arrangement, I can't handle sleeping on the ground anymore, but he memories I have of camping with my family when I was little is wonderful! Make those memories, time goes by so fast, my youngest is graduating from high school this year and it seems like he just started kindergarden! Thanks for sharing, a friend in East Texas, Pam.